AM: So it sounds like you are planning some products aimed at the old school gamer. AC: We've got a Tomb of Horrors superadventure coming out this summer as well, last year when we kicked off the DM rewards programs through the RPGA, the first product we sent out to everyone who signed up was a revamp of the Village of Hommlet. We are those people, too, so we get that those are immortal stories. They remind us of when D&D was all we thought about, and then that changed for some of us. AM: Why not toss some of those classic products back into print, or do an on-demand? It strikes a lot of us as kind of odd that people are paying for Labyrinth Lord and Swords & Wizards when with one swoop you could capture that money just by selling D&D Mentzer. LS: You know, I think that things like print-on-demand are really coming into their own and it's certainly something that we're exploring and looking at. We don't have any specific plans that we're announcing yet, but it's certainly something that we're looking at. 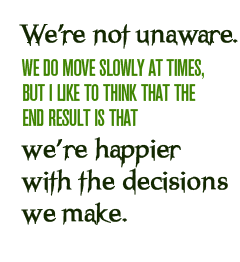 AC: We're not unaware. We do move slowly at times, but I like to think that the end result is that we're happier with the decisions we make. AM: The stereotype of the 3rd edition buyer was the teenager from the 1st and 2nd edition who returned with money to spend and just bought a ton of books. Who is the 4th edition buyer? Who do people think the 4th edition buyer is and who is he actually? LS: I think we see a pretty wide range of buyers. We see some of the people who you're describing, who have aged through the editions, but we are also seeing new players coming to the game, a lot of them from MMOGs. We see some of that conversion from digital gamers who run through what MMOGs have to offer and they're looking for something more. But we've also got a new line of what we're calling Dungeons and Dragons Essentials coming out this fall. Those products are really geared towards the new player. They're a series of smaller books, soft cover, lower price point, and boxed products, because we really want to give people an easier entry point to the game and complete experiences in a single box. The Red Box actually kicks off those Essentials. The Red Box, being true to the original Red Box, is a complete game experience in a single purchase. That's going to be $19.99, and that's a great way to get a group going and to experience D&D for the first time. But after that, in that first game, a sorting process occurs where people kind of determine, "I either want to be a player, or I want to be the Dungeon Master." And we've got products for each of those halves. For players we have two Players Essentials books, which really give the most iconic races and classes and all of the skills and feats and play a great character. If you want to be a DM, if you want to run the game, we have something called a Dungeon Master's Kit, and that's everything the DM needs to run the game. And we've never put everything you need to run a game in a single box before, so it's a great way for the new DM to really get going and have everything that he or she needs.